From the moment a baby tooth comes in, it’s susceptible to severe and tooth-destroying decay. Sure, baby teeth eventually fall out, but they still need regular dental care to prevent cavities. The dentists at Heinbach-Larkin Dental welcome children of all ages. Contact one of their offices in Topeka and Lawrence, Kansas, or schedule an appointment online for your child’s first visit or a regular checkup. If your child has a toothache, even if it seems mild, please don’t hesitate to call. Early treatment relieves the pain and protects your child’s developing teeth. When should your child meet the dentist? Your child’s first introduction to the dentist should be under positive circumstances, not when they’re in pain or have a dental problem requiring treatment. The goal of the first visit is to give children time to meet the staff, explore the environment, and learn about dental care. Children are encouraged to sit in the dental chair and let the dentist take a peek in their mouth for a quick exam without the need for anxiety-producing procedures. It's also a time for parents to ask any questions they have about issues like thumb sucking, normal teething, care for baby teeth, and cavity prevention. The dental team at Heinbach-Larkin Dental provide a safe and comfortable environment for children of all ages. They encourage parents to bring their children in for a first visit when their first tooth grows in or by the age of one. Fluoride is a natural mineral that strengthens tooth enamel. Fluoride treatments applied to teeth are safe for children and help prevent cavities. Your dentist may also prescribe oral supplements for children aged six months to 16 years who are at risk for cavities. When should children get their first full dental checkup? Your child should have a full set of 20 teeth by the time they’re three years old, which means it’s time for a thorough dental exam to be sure teeth are growing properly. This exam may include X-rays if needed. However, many children get their first X-rays around age six, when permanent teeth arrive. 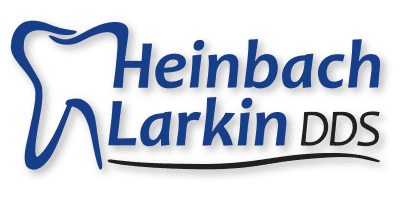 When children need a dental procedure, the dentists at Heinbach-Larkin Dental provide conservative options and deliver care in a relaxed manner. They always make sure that dental procedures are pain-free. The dentists are experts in early orthodontic intervention to correct teeth that are crowded, misaligned, or protruding. Early intervention takes advantage of bones that are still growing, which makes it easier to correct structural problems in the jaw and teeth. Dental sealants prevent tooth decay by creating a thin, protective coating on the surface of molars. They’re in liquid form when they’re applied, so they spread into grooves found in molars; then the sealant quickly hardens to create a barrier that keeps decay-causing bacteria away from tooth enamel. Sealants should be applied to molars as soon as they come in, so there’s no time for decay to occur.